1. Tell us a bit how Prospekt came to be mixing the sounds of Power Metal, Prog Rock and Symphonic Metal? I'd say it's most likely through our extensive musical influences. A lot of the bands in each genre appeal to us, so I guess we just like to mash it all up into one. 2. Prospekt is from Oxford UK; how is the underground scene in your city in 2017? It's not bad. There is a bit of a metal scene locally but the sub genres of metal don't seem to feature that much. 3. There must be a story behind The Illuminated Sky tell us about as this was an epic undertaking to say the least. Sure. It's based on one mans journey to explore the universe. It's pretty much born out of my own fascination with the universe. I find it easier to write music to a visual concept so with astronomy, it's pretty much endless! Yeah they have some great bands on the label. Always been an advocate for all things prog. 5. What would say is the major difference between live show and recording for Prospekt ? We like to add things live, add a few unique spins on our own music. Without going off on mega tangents of course! 6. If Prospekt could make a proper video off of The Illuminated Sky what track would it be and why? Hopefully a few will be out soon. It'll be for the title track as it demonstrates what our music is about and Akaibara, as it's more accessible. 7. How has the digital age (You tube, Itunes, Soundcloud, Bandcamp ) etc changed the way underground bands create and are successful in 21st century? It's great. With the right marketing, a band can get their music out there so easily. It allows more bands to enter the industry and make a go of it. 8, What are the members of Prospekt currently listening too any surprises? Ahh man loads! To name a few the new Greg Howe album "Wheelhouse", Michael Lee Firkins, The Elba Triangle and....Twilight Force - it's so cheesy but I just love the orchestration and the guitar work is awesome. 9. If a Major label came to Prospekt and offered a deal someone like Sony or Universal would you have interest or this the age of good indie label and strong pr? I think in this day and age it's a bit of both. Pros and cons to each. Guess we'd cross that bridge when we got to it haha! 10. If you could have any band cover one of your originals . What song and band would you want to hear how they would preset your music? The Hans Zimmer live band. Saw his live show last year and it was an unreal experience! 11. Do the members on Prospekt create music in any other projects. If so tell us about them? Yeah I'm currently working on a solo album to be released next year. Rox is in a super band called The Lotus. All dabble in other music avenues. 12. I always find this question insightful .. If the members of Prospekt were not making music what are you other outlets ? Probably be astronauts or something! As you can tell from the album, we like space ha! 13. 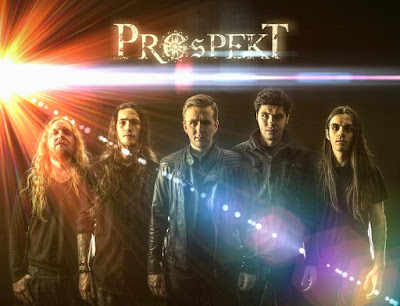 Were do you see the future of Prospekt heading what is the ultimate sound of the band you want to see? Hopefully we can follow on from the album and play some live shows and get some exposure for this album. After that, who knows! 14. Is Facebook and Social Media the best way of web interaction today or is there a need of a proper website for bands? Yeah I think for up and coming bands, it's a great way to get your name out there. With the right approach, your brand can be reached by thousands and beyond. 15. Any closing thoughts place here. Thanks for taking the time to listen to the album and keep on rocking!